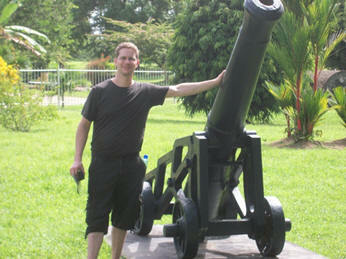 Our trip to Suriname was very good and very profitable. We had a gospel-meeting four nights with the English speaking church, besides that we made a lot of personal visits with a number of Christians and Christian families. During these studies the Bible would be opened and wonderful discussions were the result. The brethren were very open to the pure gospel. I travelled together with my good brother in the faith, Peter Vandebuerie, from Houthalen in Belgium. 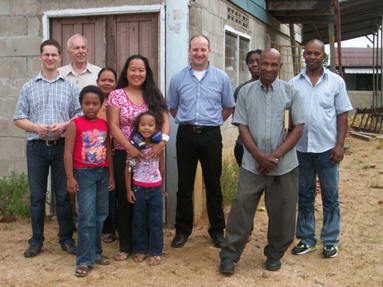 During our time in Suriname our hosts were Wes and Titia Kroezenga. We have known Wes and Titia for about 3 years now and they were very good hosts. We enjoyed being in their home and we are very thankful for their hospitality. We left early in the morning at about 7.00 AM to travel to the city of Haarlem, where a brother from the church lives, we parked the car at his place and he took us to the airport. We departed Schiphol airport at about 13.00 in the afternoon. We arrived local time 18.30, at Zanderij (Joseph Pengel airport) in Paramaribo, Suriname. 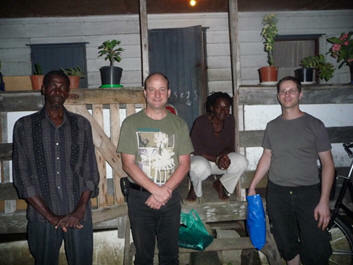 We took a taxi and arrived safe and sound at brother Wes and sister Titia’s house at about 21.00 local time. It was good to see them again, the last time I was here was back in March of 2011. This day we took some rest and to do some little errands. We went to the local mall, did some small groceries and walked around and enjoyed the wonderful weather. We went out to evangelize in the morning, inviting folks to the meetings and in the late-afternoon and night we did three visits with the local preacher, Dhan Ramkelawan. We visited one girl, Kimi a Christian, who had not been coming out to services, we encouraged her to come out and be faithful in her attendance. After that we visited a lady, Bibi, who had lost her husband a year ago and whose son was in prison waiting for trial. We were with her to encourage her. 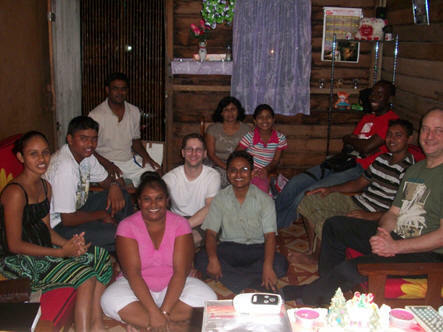 Then we went and had a study with the Ramrattan family who had also invited friends for a good study. Both Peter and I spoke that night. Peter spoke about the story of Asa from 2 Chronicles 13- 16 and I spoke on Psalms 121. We took the morning to pass out flyers for the meeting again. We went to the market-place. Later in the afternoon we did some visitation again. We visited with sister Datsy, a woman of 59 years of age who became a Christian last year in April. She was one of the contacts that we made on my last trip here back in March of 2011. It was great to see her again, especially now that she had become a Christian. At night we visited with a family for a short visit of encouragement and after that we went to a place where several families had met to hear the gospel. Peter spoke about king Asa of 2 Cron. 13- 16 and I continued that study with thoughts from Colossians 3: 1- 10. During our time of study we learned that one of the ladies that was present in the study had lost her husband, he was a fisherman and their boat had been robbed by pirates. All were killed except one. All that happened about three weeks ago. Because of this we also looked at Psalms 23 to encourage this lady, we also prayed with her, in the study and after the study. It was a long day, but it was good. In the morning we helped out Wes and Titia with some things around the house. One of the sisters, Henna, came for lunch and we had a very pleasant time with her. This day was also the first day of the meeting. Peter spoke on “the fear of God is the beginning of faithfulness”. Peter used Exodus 19 as his starting point and showed how the fear of God stands at the heart of our lives and relationship with God. We had a great meeting, we had a total attendance of about 70 people. 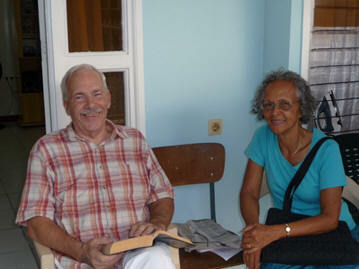 In the afternoon we visited with a way-ward sister who had not been assembling with the church for about two years. It was the second day of our meeting. I spoke and presented a lesson on “Faithfulness in assembling with the saints”. I spoke about the importance of meeting when the church meets, this to provoke one another to greater service and love for God and one another. 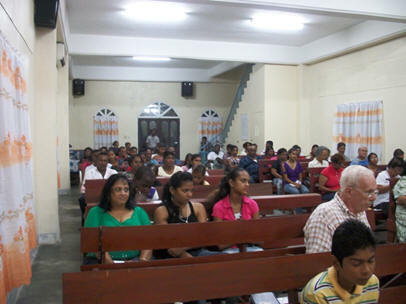 In the morning-hours we had a study with the young Christians of the English speaking church. We made application to our lives and how we all need to listen to the older. This was the third day of our meeting and Peter did a lesson on “Moses and his leadership”. Peter spoke about the concept the leadership is important and with Moses as an example of leadership Peter encouraged everyone to stand up and be counted. In the morning we went to the English speaking church. Peter did a lesson on parable of the sower from Luke 8. I spoke during the worship-service, my lesson was on “Faithfulness in prayer”. I focused on how God is the avenger of them that pray to Him day and night, Luke 18: 1- 8, and how God answers prayer from Revelation 5- 9. In the afternoon we met with the Dutch speaking group and Peter spoke on “The Christian and forgiveness”. 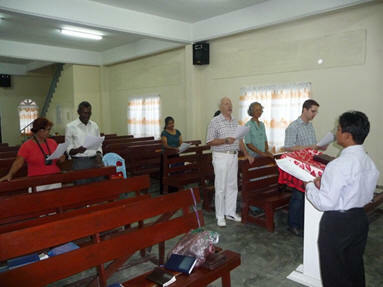 The city of Paramaribo has two Dutch speaking churches. One meets in the afternoon in the building of the English speaking group and the preacher, Dhan Ramkelawan, also works with this group. At night I spoke for the English speaking group and I did a lesson on “Faithfulness in clothing”. It was a confrontational lesson, but it was well received. That night we also went with the bus to take people home. The English speaking group picks up people at their home, bring them to services and also takes them back home again, they do this with a bus. Some of the members that are picked up first travel about 1.5 hours, then have services and then travel again for 1.5 hours. It was so good to witness this dedication. Later that night, we also enjoyed some good conversations about the role of women in the church, with two of the leaders of the English speaking group. This day, late afternoon and night, we were able to visit with a family from the English speaking church. We were invited for supper, Shirley and John, we enjoyed good food and a good time with them. We prayed, we sung and the gospel was shared with a young mother from the neighborhood. We also enjoyed some good study as how to use the money of the church. In the morning I visited with two people, that were friends from Christians in the Netherlands, they had given me some presents to give to them, I took some tracts from the church and gave them to these folks. At night we had a wonderful time and study at the home of the Ramrattan family. I did a study on thankfulness. Dahn had asked me to do a study on thankfulness since one of the families was married for one year and also they had been baptized on that day. We enjoyed good study-time and wonderful conversations. In the morning we visited with three different families, one was a young Christian girl who had not attended services for a number of weeks, Kimi, after that an older lady, Bibinisha, she is not yet a Christian, one of her daughters is a Christian and she also shared an interest. After that we visited with Debbie and William, Debbie is a Christian and we had a wonderful time together. At night we had Bible-study with the English speaking church. Peter spoke and did a lesson on “Why do marriages fail”. At noon one of the sisters came, Henna, to make lunch for us and we visited, studied and had a wonderful time with one another. 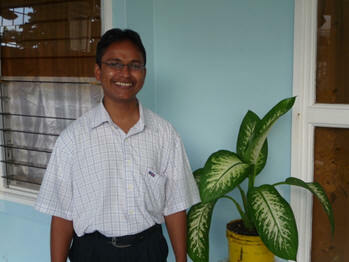 Late afternoon we had a study Imro, he is a Seventh Day Adventist who we had met while evangelizing. We had a very good study with him, he invited us to come back, so we made plans to get together on Tuesday the 24th. On Thursday a lady had died, she was the mother and grandmother of members of the English speaking church. This lady herself was not a Christian, but we were all invited to come to the wake. Dahn, the preacher for the English speaking church, had an opportunity to speak and he spoke words of comfort and he also preached the gospel and he did so very eloquently. On the morning of this day we had a study with some of the young Christians of the English speaking church. We taught them some new songs and Peter did a short lesson on “Lot and his choice” from Genesis 13- 18. On the morning of this day we went to the other Dutch speaking church. Peter spoke in the Bible-study and he spoke on unity. I did a lesson on Nehemia 6 and the relation to the glory of God, how it was manifested in his life and how it serves as an example for our lives. At night we were with the second Dutch group, they meet in the building of the English speaking church, and I spoke on the life and example of Mefiboseth. In the morning we went out to a place just outside of Paramaribo, called Commewijne, we did some sight-seeing together with Wes and Titia. At night we were invited by a couple, Patrick and Christine, they invited us for supper and we had wonderful visit with them. They had some problems with their marriage and we were able to have a wonderful and good discussion with them about these matters. They invited us back, and so we decided that we would go back on Wednesday-night the 25th. On the morning of this day we visited with Debbie and Williams. We had visited with them before on our trip and they invited us again. They had some questions for us, among others we discussed questions in relation to the Lords supper and the re-birth. In the afternoon we visited with sister Lovin, she turned 65 years of age and invited us to come and visit with her. Later in the afternoon we had our second study with Imro. We had a very pleasant time with him. We discussed several questions, his sister Wilma, also joined us in parts of the conversations. Dahn, the preacher for the English speaking group would continue this study. At night we were invited for supper at the house of a sister named Bibi, she had a wonderful meal prepared and we enjoyed some good singing too. Later in the afternoon we visited with one of the families of the English speaking church, we had supper with them, after that we went to another family to have a Bible-study. Peter taught a lesson on several aspects of raising children. After that we visited with Patrick and Christine, they had invited us to come again and talk about their marriage and to have supper, so we did. This was our last day in Suriname, in the morning we had a study with Dahn, the preacher for the English speaking church, Dahn wanted to discuss some questions in relation to marriage. In the afternoon we were picked up by our taxi, he took us to the airport. We arrived safely at Schiphol airport in Amsterdam at about 8 in the morning. Jim Krumrei, a brother in the church, took us from the airport and took us to his house. He lives close to the airport and we had parked the car at his place. We had coffee together and then we went to my home. Peter had parked his car at my place when we came to my house, Peter left to go to his house to meet his family.